Non-attacking Heartless that are rarely found. They like to jump, so helping them stay in the air may bring good things. The Rare Truffle is an Emblem Heartless found in Kingdom Hearts. A Rare Truffle has a spherical, pitch black head with two glowing yellow, beady eyes. It wears a round, yellow cap on its head that sports two blue, angular spirals on its front and two orange stars on its back. It also wears a bright blue smock that completely covers its legs and thin, fingerless arms. 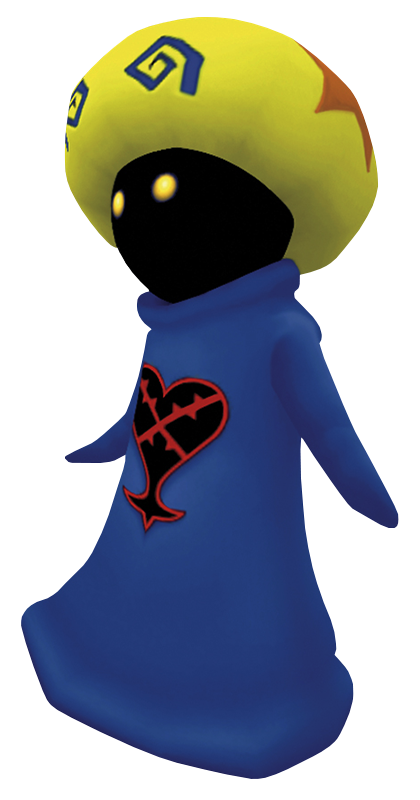 Its Heartless emblem is present on the front of this smock. In Halloween Town, the Rare Truffle's color scheme is dulled and ashen, and its texture is grainy to match that of the world itself. The Rare Truffle's name refers to truffles, an edible genus of mushrooms that were, for many years, unable to be effectively cultivated, and were difficult to find in nature. The Rank items are obtained from Rare Truffles in Kingdom Hearts. They are proof that Sora satisfied a Rare Truffle by bopping it into the air a set number of times, and have no purpose beyond being sold. Shiitake Rank (達人の証, Tatsujin no Akashi?, lit. "Expert's Proof"): Bop the Rare Truffle into the air fifty times. Its resell value is a mere 100 Munny. Matsutake Rank (名人の証, Meijin no Akashi?, lit. "Master's Proof"): Bop the Rare Truffle into the air 100 times. Its resell value is a mere 500 Munny. The Rare Truffles indicate their desire to be in the air by constantly hopping around, and will richly reward anyone who can satisfy them. However, if they touch ground again after being launched into the air, they immediately depart. While they can be kept in the air with well-timed jumps and incomplete Keyblade combos, the easiest method of satisfying them is to herd one into a corner and then use an Aero spell. Touching the wind around Sora will launch the Rare Truffle into the air, and as long as it continues to fall onto this wind it will bounce back up, so the requisite 100 hits can be reached by simply staying beneath the Rare Truffle and recasting Aero as necessary. Rare Truffles grant Tech Points each time they are bounced, and each consecutive bounce grants extra Tech Points so that a full 100 bounces will reward Sora with 5050 Tech Points. Rare Truffles can be easily satisfied in Neverland as each hit can be timed while flying, but the timing changes upon reaching the vertical limit of the field, but should be kept away from the ship's mast, sails, and sides to prevent items from falling overboard. They can also be easily satisfied in Halloween Town, where they appear in a narrow sewer with high walls. ↑ 1.0 1.1 The Tech count goes up each time the Rare Truffle gets tossed into the air.